See through walls by using the way signal strength varies in wireless networks? It ought to be possible and now researchers at the University of Utah say that they can do it with variance-based radio tomographic imaging (VRTI). According to their paper, VRTI images movement, not static changes in attenuation. 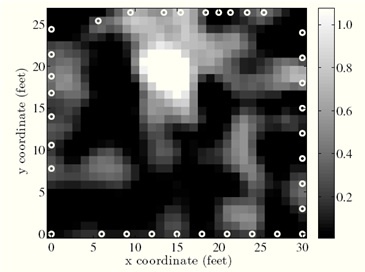 In the image below, a human subject is taking small steps randomly around and through the space marked as (17.6, 21.3) in the graph shown below. The white spot shows where VRTI 'sees' the subject. The basic idea is straightforward. The signal strength at any point in a network is the sum of all the paths the radio waves can take to get to the receiver. Any change in the volume of space through which the signals pass, for example caused by the movement of a person, makes the signal strength vary. So by "interrogating" this volume of space with many signals, picked up by multiple receivers, it is possible to build up a picture of the movement within it. In tests with a 34-node network set up outside a standard living room, Wilson and Patwari say they were able to locate moving objects in the room to within a meter or so. Interested in seeing through walls? Take a look at four different technologies - Prism 200, LEXID handheld, LifeReader and the DARPA Radar Scope. Science fiction fans have enjoyed various versions of this technology for many years. Consider the Subphoton Search Ray from The Shining One (1937), the Probability Time Wave Tube from Elimination (1936) and the X-Beam Projector from Diamond Planetoid (1937). From Through-Wall Motion Tracking Using Variance-Based Radio Tomography Networks via MIT's Technology Review.